What spiritual activities are you involved in tonight? Home » Blogs and Links » What spiritual activities are you involved in tonight? Christians in the UK are mostly cautious or even hostile towards Halloween but it has become a significant cultural festival with us spending an estimated £430m on Halloween products this year. Considering that we are a predominantly secular society it is a very strange cultural phenomenon. It usually involves children dressing up in strange costumes – some ghostly, some devilish and some sci-fi – and going knocking on people’s doors with “trick or treat” offers along with themes parties for children and adults. It’s not that we are afraid because we believe, like the Celts, that it was the night when the boundaries between the living and the dead overlapped, or that the deceased would come back to life and cause havoc such as sickness or damaged crops. It’s not that we don’t want to honour (hallow) the name of those Christians who have died in the past – part of the history of Halloween. (Although we certainly don’t believe they need help out of purgatory). Neither do we think that the majority who celebrate Halloween by dressing up and doing “trick or treat” and attending parties believe in ghosts and spirits of the dead or are devil worshippers (in that sense). For most of them it’s a bit of fun on a par with Bonfire night and Christmas. I guess at the heart of it we feel nervous about participating in something which at its core is either celebrating or making a joke of the devil, evil spirits, ghosts and dead souls. We know that the costumes and the strange rituals mean nothing in themselves, but we believe the spiritual world really does exist and don’t want to trivialise it. Halloween can only be “celebrated” as it is by contemporary culture precisely because it does not take the concept of spiritual evil seriously. If we’re honest perhaps it also exposes our own failure at times to take the reality of the spiritual world seriously. In practice we can often marginalise or demythologise the important Biblical theme of spiritual forces – the devil, demons, their spiritual power and evil intent. Rather than reacting against Halloween just as a matter of principle it might be better to take the opportunity to consider more carefully what the Bible teaches about spiritual evil. We need to regain a proper Biblical Theology of Satan and the spiritual powers of evil. Some Christians just want to embrace the whole thing and use it as opportunities for witness and relationship building. We must be careful not to judge this harshly as if it was as bad as embracing evil itself. Some want to greet children knocking their doors with give them treats, in fact loads of sweets because we want to be generous like our Father is generous to us (Matt 6:25ff). And having given them sweets, we then give them a tract, explaining as we do, that we are giving them this because we want them to know the best treat – Jesus, who has defeated the powers of evil. What is there not to like about that! But I wonder again whether in the context it will make much of an impact. 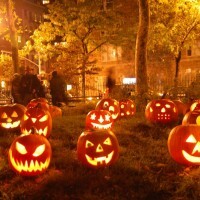 Some want to somehow sanctify it by hosting or attending a light party, or superheroes themed party on Halloween night. There might be value in that, but to me, it seems like trying too hard to compete with the real Halloween and might be signalling to our children that we don’t want them to miss out. The subtleties of rebranding it might be rather lost on them. Could it also be a night of the year when we model the reality as a family that discipleship sometimes means sacrifice? We can teach our children that following Jesus will sometimes mean feeling like strangers and aliens at times in this world? (1 Peter 1:1). Could Halloween be a chance as a family to stand apart? But whatever you do, it’s a great opportunity to talk with your family and friends about the reality of evil and the triumph of Christ. A helpful and thought-provoking article – we’ve done all of the above as a family and in previous Churches!